This gladiator skirt will work for either a gladiator costume or for a roman soldier. 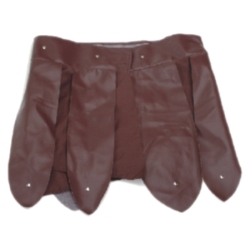 The gladiator skirt is made of brown vinyl with metal studs, has a fabric underskirt and has an adjustable Velcro waist band that will fit up to a 38” waist. Skirt measures 17" from waist to lower point.